I taught a "Mastering Chicken" Class on Tuesday evening at The American Table, in Collingswood, NJ. It was a variation on a class I taught years ago at Williams Sonoma, called, Chicken Chicken Chicken. This week's class concentrated on essential techniques of roasting, pan searing, making pan sauces and an oven-frying technique that's lower fat and less messy (WAY LESS) messy than deep or pan frying. The class was sold out and was a huge success. The evening was a lot of fun, filled with a room-full of vivacious women. Chatty, fun, sparkling conversations and good wines. I haven't had a more lively and entertaining evening of teaching in a long time. All of my classes at The American Table have positive experiences, but there was something about tonight's wild yet controlled event that was unbridled foodie fun. I prepared three chicken recipes. The first was a variation on chicken with 40 cloves of garlic. I've changed out a few things, cutting back on the garlic, adding in more herbs and cutting out the 1/2 cup of unneeded olive oil and the cup of wine. 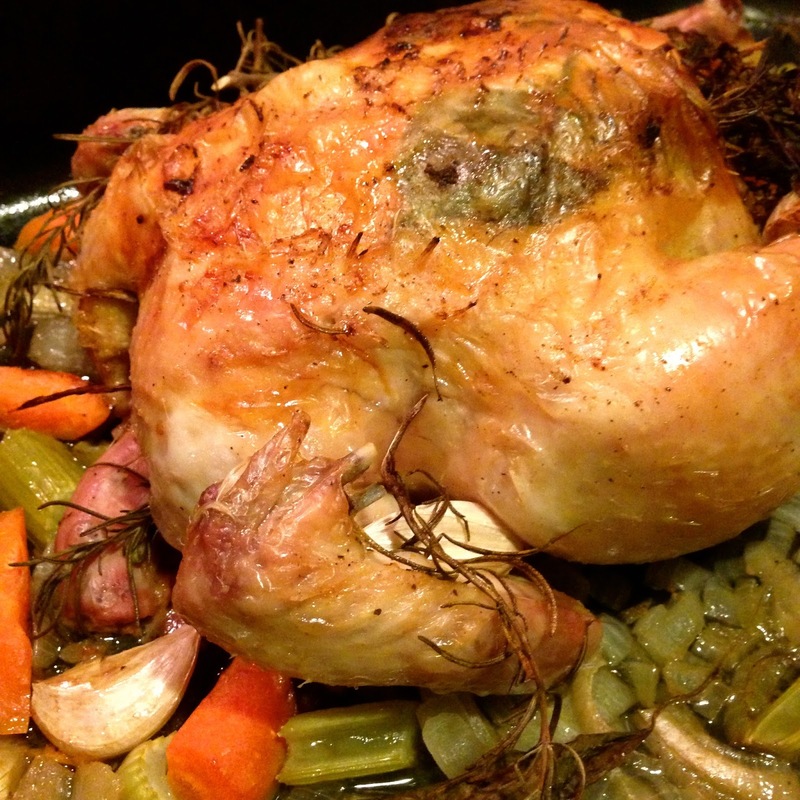 It's not difficult to make a great home-roasted chicken but for whatever reason, so many people are intimated by the poulet. Don't be a chicken! Try this recipe and know that you'll have a delicious dinner, with left-overs for the next day and still enough chicken to pick off the bones to make a wonderful Asian Chicken Salad on day 3. Remove the giblets and innards from the chicken; pat chicken dry with paper towels (dispose of paper towels) Reserve giblets & innards for making stock or discard. Generously season the inside and outside of the chicken with salt & pepper, lift skin from breast and season underneath as well. Sprinkle the olive oil & paprika over the top of the chicken, rubbing them into the skin. Place 2 or 3 pieces of celery, carrots & several pieces of the onion inside the chicken cavity. Add in the reserved lemon halves, a sprig of parsley, thyme and oregano inside the chicken too. Tuck wings under chicken & tie or truss legs together. In a deep roasting pan or casserole dish, lay the rest of the celery, carrots & onions and herbs in the bottom of the pan. Place the chicken on top of the vegetables & herbs. Tuck the garlic cloves in and around and underneath the chicken. Pour lemon juice & the white wine or vermouth over the chicken. If pan juices and liquid evaporates during the cooking time when the chicken is uncovered and is browning, add in a 1/2 to 1 cup of water to the pan. Remove the chicken from the oven when it has reached 170 degrees, and if you wish, transfer it to a platter. Loosely cover the chicken with foil and allow the chicken to rest for 15-20 minutes to allow the juices in the bird to redistribute. Serve the chicken with the pan juices - if they seem too thin, heat the juices in a sauce pan on the stove & reduce by half. There is a lot of seasonings in the pan juices, so no need to add additional seasonings. Serve the garlic cloves w/the toasted baguette slices, popping the garlic from their skins & spreading the softened & mellowed garlic like butter onto the bread. Serve the veggies w/the chicken. Slice the chicken breast, take the wings, legs and thigh joints off the chicken and serve hot. Chicken will hold, covered and refrigerated for up to 5 days. It's best to remove the chicken meat off of the carcass after 1 day, discarding the bones (or reserving the carcass to make chicken soup or stock later). I can't wait to try this! YUM! Thanks!